A 1905 newspaper ad touts the choice homes on Waverly Way, just made ready for occupancy. This row of residences stood on the north side of the street (now known as West 34th Terrace), between Pennsylvania and Washington Streets. All of Waverly Way, from Broadway to Pennsylvania, has now been converted to commercial use and the homes are gone. The house on the corner of Waverly Way and Pennsylvania as it appeared in 1940. Waverly Way – once a street lined with residences and apartment buildings in a thriving Midtown – has now disappeared. Even its name is gone. 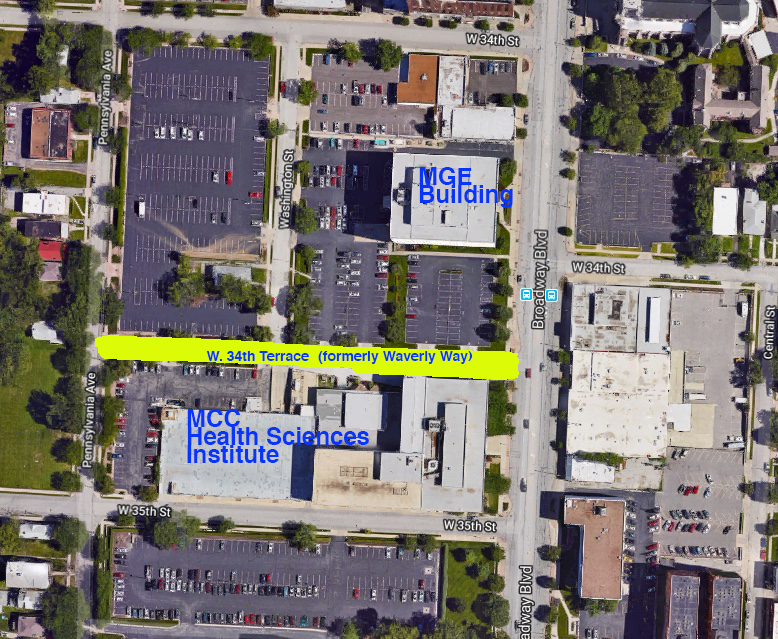 The street is now called W. 34th Terrace, sandwiched in between the vacant MGE Building at 34th and Broadway and the Metropolitan Community College Health Sciences Institute just to the south. Where the houses seen in the newspaper ad above stood are now large commercial buildings surrounded by parking lots. As part of our Uncovering History Project, the Midtown KC Post is taking a look at each block in Midtown, including a set of 1940 tax assessment photos which is available for many blocks. 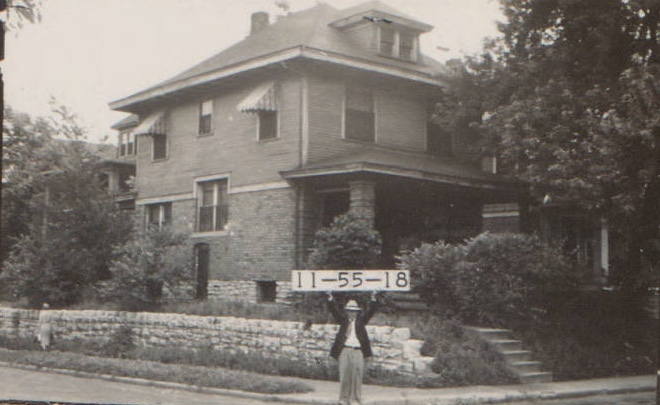 (Many people seem confused by the tax assessment photos, which all include a man holding a sign. Here’s the story behind them). Today, Waverly Way (W. 34th Street) from Broadway to Pennsylvania. A 1909-1950 Sanborn map shows the houses along Wavily Way which are now all gone. The area around the former Waverly Place was often identified as Redemptorist Parish, pointing to the proximity to the Catholic Church and later school. This 1891 map shows the church on the east side of Broadway. 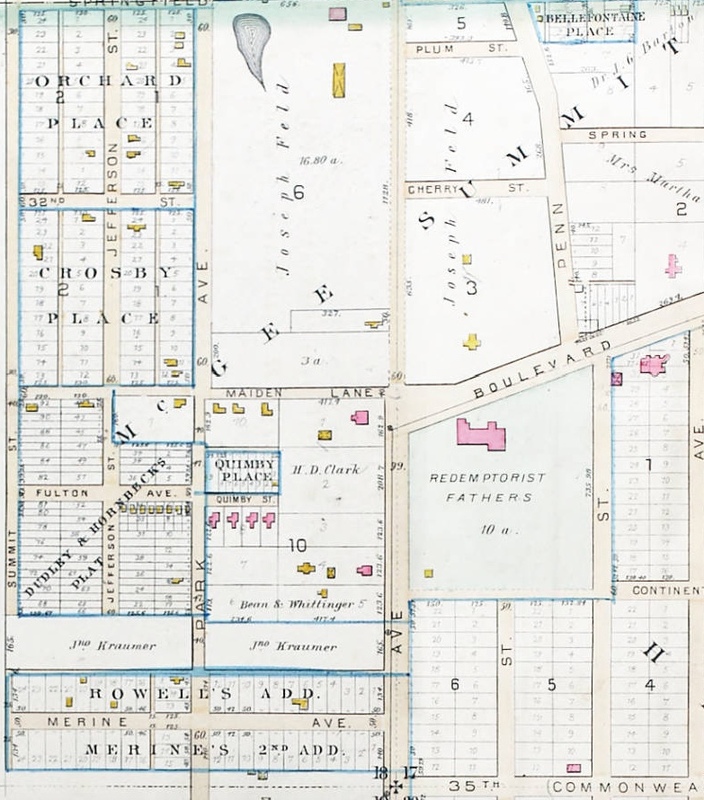 Waverly Way, or W. 34th Terrace, had not been laid out when this map was created. Map from A Complete Set of Surveys and Plats of Properties of Kansas City, Mo. 1891. Some Midtown blocks were built for the wealthy. Some were made for the working classes. Waverly Way was created for the middle class, offering “moderately priced homes,” according to one developer. J.C. Hamrick, Jr. advertised a row of six homes along the north side of Waverly Way in 1905, promising “high class ideas and workmanship” and a choice location. Each had six to eight rooms, double polished oak floors, exposed nickel plumbing, and a granitoid basement. By 1910, census records show several families living along Waverly Way, although the majority of them rented rather than owned their homes. There was a saloon keeper, M.G. McCarthy, born in Ireland, who lived at 408 with his wife Mary (who parents were born in Ireland), brother-in-law Charles Sweeney, a mail carrier, three daughters and four sons. William Dunbar and his wife Katherine, each one with an Irish-born parent, lived at 420. Dunbar was a railroad machinist. Mill engineer Charles Butler and his wife, Elizabeth, rented one of Hamrick’s homes at 432 Waverly Way. Ten years later, in 1920, Bulter now owned his home, as did many of his neighbors. Next door at 430 was Tailor Phillip Gerhardt, 48, wife Elizabeth, two daughters, and father-in-law August Spies. All had been born in Germany. Dentist Herman R. Francke (or Franke), 46, wife Nellie, a son, two daughters and a nephew owned the home at 432. At 438, Widow Anna Turgeon, 62, lived with three sons and two daughters. Anna’s parents were Irish and English. And Butler was still there in 1930. The family had taken in a boarder, Dorothy Bakewell, a biscuit company packer. Anna Turgeon was still there as well, living with a son and two daughters, as well as a lodger, Helen Clemens, a clothing store stenographer. Mary Leifhelm, a widow, had moved in at 440 when her husband, city custodian Herman, was still alive. She shared the home with two daughters, a granddaughter, two grandsons and a sister-in-law. The slide show below shows the houses on the block as they looked in 1940. A recent Google Map photo of the former Wavily Way, now W. 34th Street. The homes that once lined the street have been replaced by parking lots. The homes along Waverly Way were still standing as those 1940 photos were taken, but the character of the area had been changing. Gradually, Broadway was being transformed from a residential street, home to very wealthy Kansas Citians, to a major commercial corridor. Over the years, those commercial operations gradually replaced many of the homes, including those on Waverly Way, with parking lots to serve their employees. The book, Kansas City’s Historic Midtown Neighborhoods, is available now at local bookstores and on Amazon.com. Let us know if you want us to come to your neighborhood association or organization’s meeting to share what we’ve learned about Midtown neighborhood history and tell your members how they can help preserve Midtown history.